We arrived in Ghent in the evening and immediately went to the Christmas market to get dinner. We arrived just in time to eat sausage, fries, and nutella waffles for dinner (healthy people should probably avoid the Christmas markets). For those that have never experienced a Christmas market, the idea is to eat from food stands and enjoy copious amounts of Gluhwein (mulled wine) while you browse artisanal stands selling cute Christmas-themed trinkets or other handmade goods. 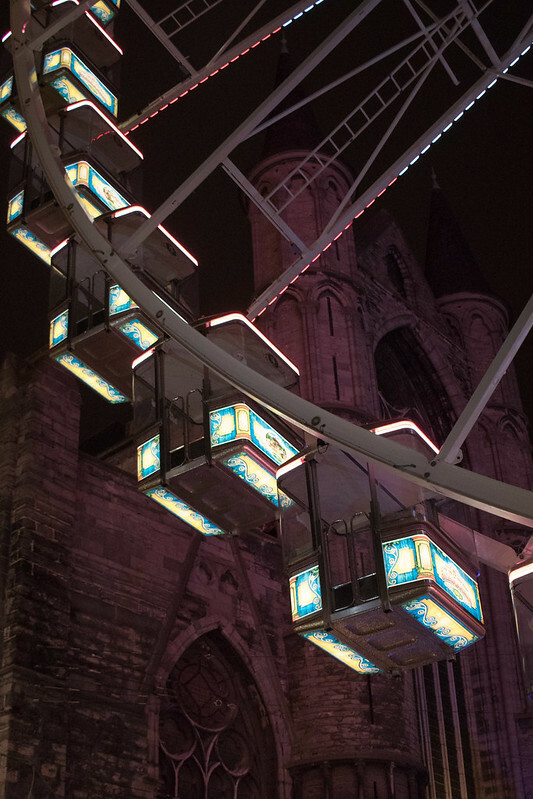 The one in Ghent is quite big and you can even ice skate or ride a ferris wheel. Walking around Ghent at night is also wonderful because all of the monuments are lit up as part of the Ghent light plan. The next morning we decided to wander into some of the old buildings in Ghent. As an American, I’m not used to medieval castles and cathedrals so Ghent looked like Disneyland to me, except real and not full of cartoons. Our first stop was St. Bavo’s Cathedral, which houses the Ghent altarpiece. The cathedral is super majestic and those van Eyck brothers were really good at painting. I definitely recommend paying the 4 euros to see the altarpiece. Across the street from St. Bavo’s is the Belfry of Ghent. You can go up to the tower (8 euros) and learn about the history of Ghent and see the tower’s gigantic music drum on the way up so it’s a good bargain. 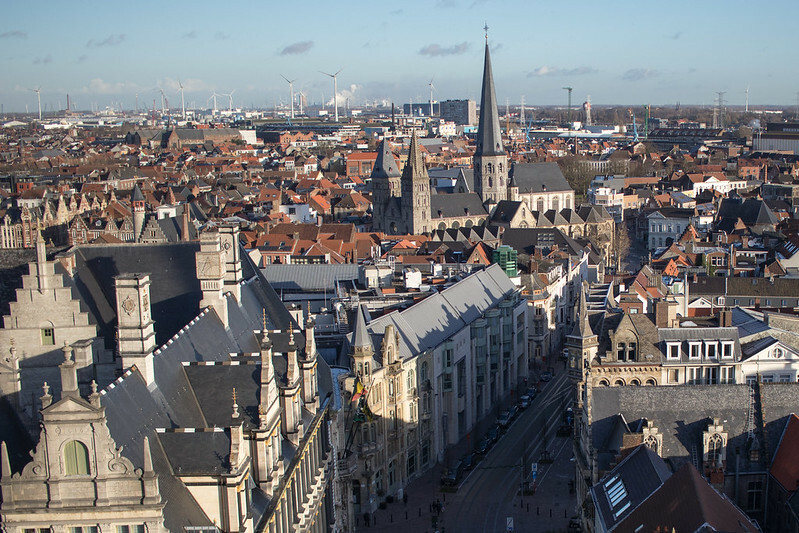 On a clear day, you can also see most of Ghent. I really liked the contrast between the old town and the wind turbines on the outskirts. We worked up an appetite so we stopped by Soup’R for lunch. They have really tasty soups and sandwiches, which are perfect for a cold winter’s day. For dessert, we got a large assortment of chocolates at Chocolater Luc Van Hoorebeke (they thought we were buying gifts, ha!). My next stop in Ghent was for some mustard at Tierenteyn-Verlent. 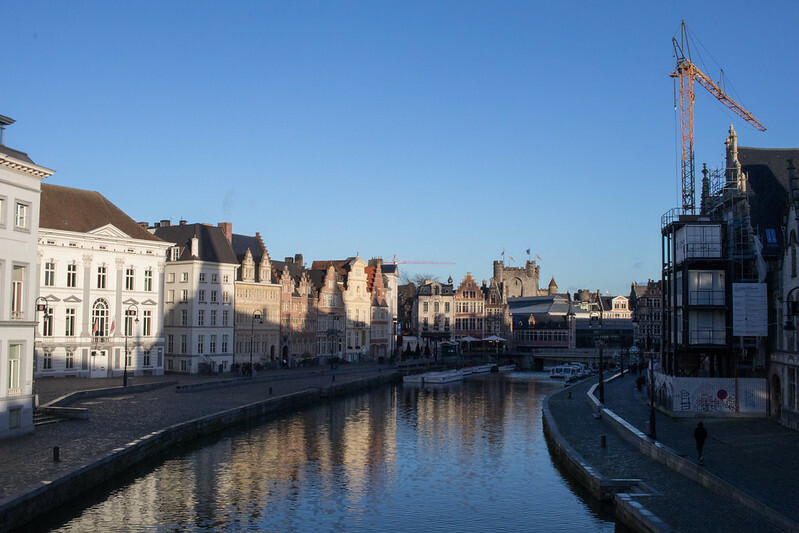 Local history says that a member of the Tierenteyn-Verlent family learned how to make stone-ground mustard in Dijon during the 1700s and brought it along to Ghent. The mustard is sharp but not overpowering and the store smells of mustard as you walk in. For a pre-dinner drink consider going to t’dreupelkot where they have many different kinds of jenever (a Belgian/Dutch specialty). Jenever tastes kind of like a whiskey-ish gin. At t’dreupelkot, you can have it flavored with many different kinds of fruits or herbs. The bar is very cozy and it’s a nice place to stop for a drink of two. We ended our time in Rotterdam with dinner at Vrijmoed. The food was delicious and they have a great vegetarian tasting menu (sometimes, very infrequently, I do get tired of only consuming sausages and cheese..). It was a perfect way to end our weekend in Ghent. A couple of notes: Ghent is about an 1hr and 40 minutes by either train or car. We stayed at the B&B Logies Onderland. It is comfortable, about a 10-minute walk down a street with lots of cool shops to the town center, and quite cheap (78 euro for 2 including breakfast). I would definitely recommend it.